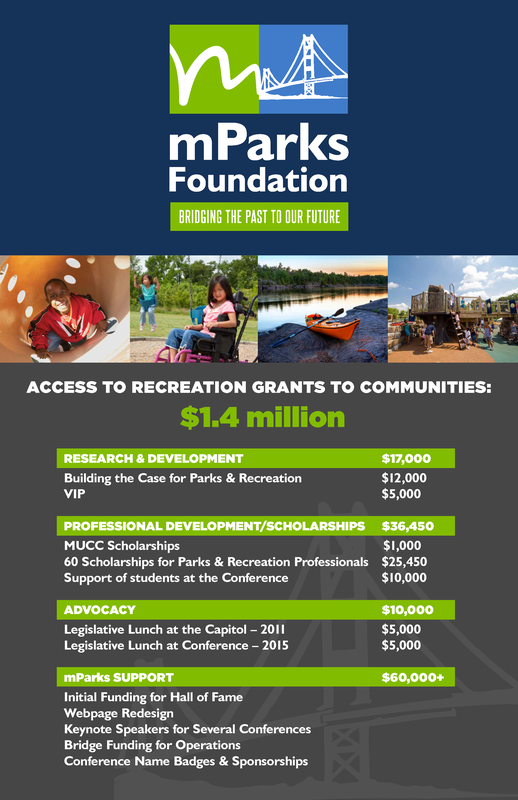 Established in 2002, the mParks Foundation provides financial support to people and programs that work to enrich the health and well-being of all Michigan citizens through increased access to recreation and outdoor experiences. In addition, the Foundation supports ongoing professional development opportunities and recognition of parks and recreation practitioners. Increased access to recreation and the outdoors for people of all ages and abilities through funding for adaptive equipment and innovative projects. Opportunities for education, professional development for recreation professionals, and scholarships for those intending to enter the parks and recreation profession. Recognition for outstanding communities and parks and recreation professionals through the support of the Hall of Fame and Accessible by Design Awards.